1 A None No Power Seat 1 A is a standard Economy Max Class seat which offers 5 more inches of legroom than the standard Economy Class seat. This seat is located at a bulkhead. There is no floor storage for use during takeoff and landing. The tray table and IFE monitor are placed in the armrest making the armrest immovable and slightly reducing seat width. The proximity to the galley and lavatory might be bothersome. 1 B None No Power Seat 1 B is a standard Economy Max Class seat which offers 5 more inches of legroom than the standard Economy Class seat. This seat is located at a bulkhead. There is no floor storage for use during takeoff and landing. The tray table and IFE monitor are placed in the armrest making the armrest immovable and slightly reducing seat width. The proximity to the galley and lavatory might be bothersome. 1 D None No Power Seat 1 D is a standard Economy Max Class seat which offers 5 more inches of legroom than the standard Economy Class seat. This seat is located at a bulkhead. There is no floor storage for use during takeoff and landing. The tray table and IFE monitor are placed in the armrest making the armrest immovable and slightly reducing seat width. The proximity to the galley and lavatory might be bothersome. 1 E None No Power Seat 1 E is a standard Economy Max Class seat which offers 5 more inches of legroom than the standard Economy Class seat. This seat is located at a bulkhead. There is no floor storage for use during takeoff and landing. The tray table and IFE monitor are placed in the armrest making the armrest immovable and slightly reducing seat width. The proximity to the galley and lavatory might be bothersome. 1 F None No Power Seat 1 F is a standard Economy Max Class seat which offers 5 more inches of legroom than the standard Economy Class seat. This seat is located at a bulkhead. There is no floor storage for use during takeoff and landing. The tray table and IFE monitor are placed in the armrest making the armrest immovable and slightly reducing seat width. The proximity to the galley and lavatory might be bothersome. 1 G None No Power Seat 1 G is a standard Economy Max Class seat which offers 5 more inches of legroom than the standard Economy Class seat. This seat is located at a bulkhead. There is no floor storage for use during takeoff and landing. The tray table and IFE monitor are placed in the armrest making the armrest immovable and slightly reducing seat width. The proximity to the galley and lavatory might be bothersome. 1 J None No Power Seat 1 J is a standard Economy Max Class seat which offers 5 more inches of legroom than the standard Economy Class seat. This seat is located at a bulkhead. There is no floor storage for use during takeoff and landing. The tray table and IFE monitor are placed in the armrest making the armrest immovable and slightly reducing seat width. The proximity to the galley and lavatory might be bothersome. 1 K None No Power Seat 1 K is a standard Economy Max Class seat which offers 5 more inches of legroom than the standard Economy Class seat. This seat is located at a bulkhead. There is no floor storage for use during takeoff and landing. The tray table and IFE monitor are placed in the armrest making the armrest immovable and slightly reducing seat width. The proximity to the galley and lavatory might be bothersome. 10 D None No Power Seat 10 D is a standard Economy Max Class seat which offers 5 more inches of legroom than the standard Economy Class seat. The proximity to the galley and lavatory might be bothersome. 10 E None No Power Seat 10 E is a standard Economy Max Class seat which offers 5 more inches of legroom than the standard Economy Class seat. The proximity to the galley and lavatory might be bothersome. 10 F None No Power Seat 10 F is a standard Economy Max Class seat which offers 5 more inches of legroom than the standard Economy Class seat. The proximity to the galley and lavatory might be bothersome. 10 G None No Power Seat 10 G is a standard Economy Max Class seat which offers 5 more inches of legroom than the standard Economy Class seat. The proximity to the galley and lavatory might be bothersome. 11 A None No Power Seat 11 A is a Business Class seat which converts to a flat bed and is located at a bulkhead. If you are a solo traveler then this is a desirable seat due to its singularity and the dual side tables. The proximity to the galley and lavatory might be bothersome. 11 D None No Power Seat 11 D is a Business Class seat which converts to a flat bed and is located at a bulkhead. The proximity to the galley and lavatory might be bothersome. This seat and the one adjacent are ideal if traveling with a companion. 11 G None No Power Seat 11 G is a Business Class seat which converts to a flat bed and is located at a bulkhead. The proximity to the galley and lavatory might be bothersome. This seat and the one adjacent are ideal if traveling with a companion. 11 K None No Power Seat 11 K is a Business Class seat which converts to a flat bed and is located at a bulkhead. The proximity to the galley and lavatory might be bothersome. 12 A None No Power Seat 12 A is a Business Class seat which converts to a flat bed. This seat and the one adjacent are ideal if traveling with a companion. 12 B None No Power Seat 12 B is a Business Class seat which converts to a flat bed. This seat and the one adjacent are ideal if traveling with a companion. 12 D None No Power Seat 12 D is a Business Class seat which converts to a flat bed. This seat and the one adjacent are ideal if traveling with a companion. 12 G None No Power Seat 12 G is a Business Class seat which converts to a flat bed. This seat and the one adjacent are ideal if traveling with a companion. 12 K None No Power Seat 12 K is a Business Class seat which converts to a flat bed. 14 A None No Power Seat 14 A is a Business Class seat which converts to a flat bed. If you are a solo traveler then this is one of the most desirable seats in Business Class due to its singularity and the dual side tables. 14 D None No Power Seat 14 D is a Business Class seat which converts to a flat bed. This seat and the one adjacent are ideal if traveling with a companion. 14 G None No Power Seat 14 G is a Business Class seat which converts to a flat bed. This seat and the one adjacent are ideal if traveling with a companion. 14 K None No Power Seat 14 K is a Business Class seat which converts to a flat bed. 15 A None No Power Seat 15 A is a Business Class seat which converts to a flat bed. This seat is missing one of two windows. This seat and the one adjacent are ideal if traveling with a companion. 15 B None No Power Seat 15 B is a Business Class seat which converts to a flat bed. This seat and the one adjacent are ideal if traveling with a companion. 15 D None No Power Seat 15 D is a Business Class seat which converts to a flat bed. This seat and the one adjacent are ideal if traveling with a companion. 15 G None No Power Seat 15 G is a Business Class seat which converts to a flat bed. This seat and the one adjacent are ideal if traveling with a companion. 15 K None No Power Seat 15 K is a Business Class seat which converts to a flat bed. This seat is missing one of two windows. This seat and the one adjacent are ideal if traveling with a companion. 16 A None No Power Seat 16 A is a Business Class seat which converts to a flat bed. If you are a solo traveler then this is one of the most desirable seats in Business Class due to its singularity and the dual side tables. 16 D None No Power Seat 16 D is a Business Class seat which converts to a flat bed. This seat and the one adjacent are ideal if traveling with a companion. 16 G None No Power Seat 16 G is a Business Class seat which converts to a flat bed. This seat and the one adjacent are ideal if traveling with a companion. 16 K None No Power Seat 16 K is a Business Class seat which converts to a flat bed. 17 A None No Power Seat 17 A is a Business Class seat which converts to a flat bed. This seat and the one adjacent are ideal if traveling with a companion. 17 B None No Power Seat 17 B is a Business Class seat which converts to a flat bed. This seat and the one adjacent are ideal if traveling with a companion. 17 D None No Power Seat 17 D is a Business Class seat which converts to a flat bed. This seat and the one adjacent are ideal if traveling with a companion. 17 G None No Power Seat 17 G is a Business Class seat which converts to a flat bed. This seat and the one adjacent are ideal if traveling with a companion. 17 K None No Power Seat 17 K is a Business Class seat which converts to a flat bed. 18 A None No Power Seat 18 A is a standard Economy Class seat located at a bulkhead. There might be restricted legroom. The tray table is placed in the armrest making the armrest immovable and slightly reducing seat width. There is no floor storage for use during takeoff and landing. 18 B None No Power Seat 18 B is a standard Economy Class seat located at a bulkhead. There might be restricted legroom. The tray table is placed in the armrest making the armrest immovable and slightly reducing seat width. There is no floor storage for use during takeoff and landing. 18 D None No Power Seat 18 D is a standard Economy Class seat located at a bulkhead. There might be restricted legroom. The tray table is placed in the armrest making the armrest immovable and slightly reducing seat width. There is no floor storage for use during takeoff and landing. 18 E None No Power Seat 18 E is a standard Economy Class seat located at a bulkhead. There might be restricted legroom. The tray table is placed in the armrest making the armrest immovable and slightly reducing seat width. There is no floor storage for use during takeoff and landing. 18 F None No Power Seat 18 F is a standard Economy Class seat located at a bulkhead. There might be restricted legroom. The tray table is placed in the armrest making the armrest immovable and slightly reducing seat width. There is no floor storage for use during takeoff and landing. 18 G None No Power Seat 18 G is a standard Economy Class seat located at a bulkhead. There might be restricted legroom. The tray table is placed in the armrest making the armrest immovable and slightly reducing seat width. There is no floor storage for use during takeoff and landing. 18 J None No Power Seat 18 J is a standard Economy Class seat located at a bulkhead. There might be restricted legroom. The tray table is placed in the armrest making the armrest immovable and slightly reducing seat width. There is no floor storage for use during takeoff and landing. 18 K None No Power Seat 18 K is a standard Economy Class seat located at a bulkhead. There might be restricted legroom. The tray table is placed in the armrest making the armrest immovable and slightly reducing seat width. There is no floor storage for use during takeoff and landing. 2 A None No Power Seat 2 A is a standard Economy Max Class seat which offers 5 more inches of legroom than the standard Economy Class seat. 2 B None No Power Seat 2 B is a standard Economy Max Class seat which offers 5 more inches of legroom than the standard Economy Class seat. 2 D None No Power Seat 2 D is a standard Economy Max Class seat which offers 5 more inches of legroom than the standard Economy Class seat. 2 E None No Power Seat 2 E is a standard Economy Max Class seat which offers 5 more inches of legroom than the standard Economy Class seat. 2 F None No Power Seat 2 F is a standard Economy Max Class seat which offers 5 more inches of legroom than the standard Economy Class seat. 2 G None No Power Seat 2 G is a standard Economy Max Class seat which offers 5 more inches of legroom than the standard Economy Class seat. 2 J None No Power Seat 2 J is a standard Economy Max Class seat which offers 5 more inches of legroom than the standard Economy Class seat. 2 K None No Power Seat 2 K is a standard Economy Max Class seat which offers 5 more inches of legroom than the standard Economy Class seat. 27 A None No Power Seat 27 A is a standard Economy Class seat. The proximity to the lavatory might be bothersome. 27 B None No Power Seat 27 B is a standard Economy Class seat. The proximity to the lavatory might be bothersome. 27 D None No Power Seat 27 D is a standard Economy Class seat. The proximity to the lavatory might be bothersome. 27 E None No Power Seat 27 E is a standard Economy Class seat. The proximity to the lavatory might be bothersome. 27 F None No Power Seat 27 F is a standard Economy Class seat. The proximity to the lavatory might be bothersome. 27 G None No Power Seat 27 G is a standard Economy Class seat. The proximity to the lavatory might be bothersome. 27 J None No Power Seat 27 J is a standard Economy Class seat. The proximity to the lavatory might be bothersome. 27 K None No Power Seat 27 K is a standard Economy Class seat. The proximity to the lavatory might be bothersome. 28 D None No Power Seat 28 D is a standard Economy Class seat located at an Exit Row. The tray table and IFE monitor are placed in the armrest making the armrest immovable and slightly reducing seat width. There is additional legroom, however, there is no floor storage for use during takeoff and landing. The proximity to the lavatory section might be bothersome. 28 E None No Power Seat 28 E is a standard Economy Class seat located at an Exit Row. The tray table and IFE monitor are placed in the armrest making the armrest immovable and slightly reducing seat width. There is additional legroom, however, there is no floor storage for use during takeoff and landing. The proximity to the lavatory section might be bothersome. 28 F None No Power Seat 28 F is a standard Economy Class seat located at an Exit Row. The tray table and IFE monitor are placed in the armrest making the armrest immovable and slightly reducing seat width. There is additional legroom, however, there is no floor storage for use during takeoff and landing. The proximity to the lavatory section might be bothersome. 28 G None No Power Seat 28 G is a standard Economy Class seat located at an Exit Row. The tray table and IFE monitor are placed in the armrest making the armrest immovable and slightly reducing seat width. There is additional legroom, however, there is no floor storage for use during takeoff and landing. The proximity to the lavatory section might be bothersome. 29 A None No Power Seat 29 A is a standard Economy Class seat located at an Exit Row. The tray table and IFE monitor are placed in the armrest making the armrest immovable and slightly reducing seat width. There is additional legroom, however, there is no floor storage for use during takeoff and landing. The proximity to the lavatory section might be bothersome. 29 B None No Power Seat 29 B is a standard Economy Class seat located at an Exit Row. The tray table and IFE monitor are placed in the armrest making the armrest immovable and slightly reducing seat width. There is additional legroom, however, there is no floor storage for use during takeoff and landing. The proximity to the lavatory section might be bothersome. 29 J None No Power Seat 29 J is a standard Economy Class seat located at an Exit Row. The tray table and IFE monitor are placed in the armrest making the armrest immovable and slightly reducing seat width. There is additional legroom, however, there is no floor storage for use during takeoff and landing. The proximity to the lavatory section might be bothersome. 29 K None No Power Seat 29 K is a standard Economy Class seat located at an Exit Row. The tray table and IFE monitor are placed in the armrest making the armrest immovable and slightly reducing seat width. There is additional legroom, however, there is no floor storage for use during takeoff and landing. The proximity to the lavatory section might be bothersome. 3 A None No Power Seat 3 A is a standard Economy Max Class seat which offers 5 more inches of legroom than the standard Economy Class seat. 3 B None No Power Seat 3 B is a standard Economy Max Class seat which offers 5 more inches of legroom than the standard Economy Class seat. 3 D None No Power Seat 3 D is a standard Economy Max Class seat which offers 5 more inches of legroom than the standard Economy Class seat. 3 E None No Power Seat 3 E is a standard Economy Max Class seat which offers 5 more inches of legroom than the standard Economy Class seat. 3 F None No Power Seat 3 F is a standard Economy Max Class seat which offers 5 more inches of legroom than the standard Economy Class seat. 3 G None No Power Seat 3 G is a standard Economy Max Class seat which offers 5 more inches of legroom than the standard Economy Class seat. 3 J None No Power Seat 3 J is a standard Economy Max Class seat which offers 5 more inches of legroom than the standard Economy Class seat. 3 K None No Power Seat 3 K is a standard Economy Max Class seat which offers 5 more inches of legroom than the standard Economy Class seat. 4 A None No Power Seat 4 A is a standard Economy Max Class seat which offers 5 more inches of legroom than the standard Economy Class seat. 4 B None No Power Seat 4 B is a standard Economy Max Class seat which offers 5 more inches of legroom than the standard Economy Class seat. 4 D None No Power Seat 4 D is a standard Economy Max Class seat which offers 5 more inches of legroom than the standard Economy Class seat. 4 E None No Power Seat 4 E is a standard Economy Max Class seat which offers 5 more inches of legroom than the standard Economy Class seat. 4 F None No Power Seat 4 F is a standard Economy Max Class seat which offers 5 more inches of legroom than the standard Economy Class seat. 4 G None No Power Seat 4 G is a standard Economy Max Class seat which offers 5 more inches of legroom than the standard Economy Class seat. 4 J None No Power Seat 4 J is a standard Economy Max Class seat which offers 5 more inches of legroom than the standard Economy Class seat. 4 K None No Power Seat 4 K is a standard Economy Max Class seat which offers 5 more inches of legroom than the standard Economy Class seat. 40 D None No Power Seat 40 D is a standard Economy Class seat. This seat might often be bumped by service carts and passengers passing from the back of the aircraft. 40 G None No Power Seat 40 G is a standard Economy Class seat. This seat might often be bumped by service carts and passengers passing from the back of the aircraft. 41 D None No Power Seat 41 D is a standard Economy Class seat. It might have restricted legroom due to the awkward configuration transition from 4 to 3 seats. The seat back IFE screen is not directly in front of the viewer due to the misalignment of the seats. Some might find this arrangement uncomfortable. 41 E None No Power Seat 41 E is a standard Economy Class seat. It might have restricted legroom due to the awkward configuration transition from 4 to 3 seats. The seat back IFE screen is not directly in front of the viewer due to the misalignment of the seats. Some might find this arrangement uncomfortable. 41 G None No Power Seat 41 G is a standard Economy Class seat. It might have restricted legroom due to the awkward configuration transition from 4 to 3 seats. The seat back IFE screen is not directly in front of the viewer due to the misalignment of the seats. Some might find this arrangement uncomfortable. 44 A None No Power Seat 44 A is a standard Economy Class seat located in the last row of the aircraft. Seat back recline might be limited. The proximity to the galley and lavatory might be bothersome. 44 B None No Power Seat 44 B is a standard Economy Class seat located in the last row of the aircraft. Seat back recline might be limited. The proximity to the galley and lavatory might be bothersome. 44 D None No Power Seat 44 D is a standard Economy Class seat. The proximity to the galley and lavatory might be bothersome. 44 G None No Power Seat 44 G is a standard Economy Class seat. The proximity to the galley and lavatory might be bothersome. 44 J None No Power Seat 44 J is a standard Economy Class seat located in the last row of the aircraft. Seat back recline might be limited. The proximity to the galley and lavatory might be bothersome. 44 K None No Power Seat 44 K is a standard Economy Class seat located in the last row of the aircraft. Seat back recline might be limited. The proximity to the galley and lavatory might be bothersome. 45 D None No Power Seat 45 D is a standard Economy Class seat located in the last row of the aircraft. Seat back recline might be limited. The proximity to the galley and lavatory might be bothersome. 45 E None No Power Seat 45 E is a standard Economy Class seat located in the last row of the aircraft. Seat back recline might be limited. The proximity to the galley and lavatory might be bothersome. 45 G None No Power Seat 45 G is a standard Economy Class seat located in the last row of the aircraft. Seat back recline might be limited. The proximity to the galley and lavatory might be bothersome. 5 A None No Power Seat 5 A is a standard Economy Max Class seat which offers 5 more inches of legroom than the standard Economy Class seat. 5 B None No Power Seat 5 B is a standard Economy Max Class seat which offers 5 more inches of legroom than the standard Economy Class seat. 5 D None No Power Seat 5 D is a standard Economy Max Class seat which offers 5 more inches of legroom than the standard Economy Class seat. 5 E None No Power Seat 5 E is a standard Economy Max Class seat which offers 5 more inches of legroom than the standard Economy Class seat. 5 F None No Power Seat 5 F is a standard Economy Max Class seat which offers 5 more inches of legroom than the standard Economy Class seat. 5 G None No Power Seat 5 G is a standard Economy Max Class seat which offers 5 more inches of legroom than the standard Economy Class seat. 5 J None No Power Seat 5 J is a standard Economy Max Class seat which offers 5 more inches of legroom than the standard Economy Class seat. 5 K None No Power Seat 5 K is a standard Economy Max Class seat which offers 5 more inches of legroom than the standard Economy Class seat. 6 A None No Power Seat 6 A is a standard Economy Max Class seat which offers 5 more inches of legroom than the standard Economy Class seat. 6 B None No Power Seat 6 B is a standard Economy Max Class seat which offers 5 more inches of legroom than the standard Economy Class seat. 6 D None No Power Seat 6 D is a standard Economy Max Class seat which offers 5 more inches of legroom than the standard Economy Class seat. 6 E None No Power Seat 6 E is a standard Economy Max Class seat which offers 5 more inches of legroom than the standard Economy Class seat. 6 F None No Power Seat 6 F is a standard Economy Max Class seat which offers 5 more inches of legroom than the standard Economy Class seat. 6 G None No Power Seat 6 G is a standard Economy Max Class seat which offers 5 more inches of legroom than the standard Economy Class seat. 6 J None No Power Seat 6 J is a standard Economy Max Class seat which offers 5 more inches of legroom than the standard Economy Class seat. 6 K None No Power Seat 6 K is a standard Economy Max Class seat which offers 5 more inches of legroom than the standard Economy Class seat. 7 A None No Power Seat 7 A is a standard Economy Max Class seat which offers 5 more inches of legroom than the standard Economy Class seat. 7 B None No Power Seat 7 B is a standard Economy Max Class seat which offers 5 more inches of legroom than the standard Economy Class seat. 7 D None No Power Seat 7 D is a standard Economy Max Class seat which offers 5 more inches of legroom than the standard Economy Class seat. 7 E None No Power Seat 7 E is a standard Economy Max Class seat which offers 5 more inches of legroom than the standard Economy Class seat. 7 F None No Power Seat 7 F is a standard Economy Max Class seat which offers 5 more inches of legroom than the standard Economy Class seat. 7 G None No Power Seat 7 G is a standard Economy Max Class seat which offers 5 more inches of legroom than the standard Economy Class seat. 7 J None No Power Seat 7 J is a standard Economy Max Class seat which offers 5 more inches of legroom than the standard Economy Class seat. 7 K None No Power Seat 7 K is a standard Economy Max Class seat which offers 5 more inches of legroom than the standard Economy Class seat. 8 A None No Power Seat 8 A is a standard Economy Max Class seat which offers 5 more inches of legroom than the standard Economy Class seat. 8 B None No Power Seat 8 B is a standard Economy Max Class seat which offers 5 more inches of legroom than the standard Economy Class seat. 8 D None No Power Seat 8 D is a standard Economy Max Class seat which offers 5 more inches of legroom than the standard Economy Class seat. 8 E None No Power Seat 8 E is a standard Economy Max Class seat which offers 5 more inches of legroom than the standard Economy Class seat. 8 F None No Power Seat 8 F is a standard Economy Max Class seat which offers 5 more inches of legroom than the standard Economy Class seat. 8 G None No Power Seat 8 G is a standard Economy Max Class seat which offers 5 more inches of legroom than the standard Economy Class seat. 8 J None No Power Seat 8 J is a standard Economy Max Class seat which offers 5 more inches of legroom than the standard Economy Class seat. 8 K None No Power Seat 8 K is a standard Economy Max Class seat which offers 5 more inches of legroom than the standard Economy Class seat. 9 A None No Power Seat 9 A is a standard Economy Max Class seat which offers 5 more inches of legroom than the standard Economy Class seat. The proximity to the galley and lavatory might be bothersome. 9 B None No Power Seat 9 B is a standard Economy Max Class seat which offers 5 more inches of legroom than the standard Economy Class seat. The proximity to the galley and lavatory might be bothersome. 9 D None No Power Seat 9 D is a standard Economy Max Class seat which offers 5 more inches of legroom than the standard Economy Class seat. The proximity to the galley and lavatory might be bothersome. 9 E None No Power Seat 9 E is a standard Economy Max Class seat which offers 5 more inches of legroom than the standard Economy Class seat. 9 F None No Power Seat 9 F is a standard Economy Max Class seat which offers 5 more inches of legroom than the standard Economy Class seat. 9 G None No Power Seat 9 G is a standard Economy Max Class seat which offers 5 more inches of legroom than the standard Economy Class seat. The proximity to the galley and lavatory might be bothersome. 9 J None No Power Seat 9 J is a standard Economy Max Class seat which offers 5 more inches of legroom than the standard Economy Class seat. The proximity to the galley and lavatory might be bothersome. 9 K None No Power Seat 9 K is a standard Economy Max Class seat which offers 5 more inches of legroom than the standard Economy Class seat. The proximity to the galley and lavatory might be bothersome. Edelweiss Air's music library includes selections from over 270 playlists plus access to radio. Edelweiss Air's video library includes over 180 selections such as recently released, classic, world cinema, and children's films, documentaries, sports presentations, television series, and Switzerland centric programs. Power is available onboard Edelweiss Air's A340 aircraft. AC power and USB ports are available at every seat in Business Class. USB ports are available at every seat in Economy and Economy Max Classes. Edelweiss Air provides full-course meals and an assortment of beverages in all classes on their A340 aircraft on long-haul flights. Edelweiss Air Airbus A340 aircraft are used on long-haul flights. The aircraft feature Business Class seats, each may be converted to a flat bed arrangement, standard Economy Class seating, and Economy Max seating which offers 15 centimeters/5 inches additional legroom. Edelweiss Air's onboard audio and video entertainment is accessed through seat back monitors. The entertainment program is produced and provided by Edelweiss Air's partner SWISS. Selections include many films, television series, children's films, games, and a world of music. AC and USB power ports are available at all seats in Business Class. USB power ports are available at all seats in Economy and Economy Max Classes. ZRH-SEZ-ZRH, very impressed with Edelweiss. Recently updated, really nice cabin with pleasant colours. Sufficiently spacious new seats and good infotainment system. Food was very good, actually one of the best I have experienced in the economy class, especially the dark bread, wow! Oh, and the price for the direct flight to Seychelles was unbeatable too (less than EUR 400), most Swiss flights within Europe are more expensive than this 10 h flight. Also very good schedule with the arrival in the morning both ways. I am a fan! Edelweiss is way better than Swiss, its parent company. The seat is missing one of the two windows due to the air conditioning duct so you have to turn your head really hard to look outside. The seat itself is a bit narrow but perfectly fine for me. The seat itself, entertainment and service was very good, nothing to complain about. Flew CPT-ZRH on this A343 (flight WK85), and it was a total disaster. First of all, WK has an awful website. I was unable to check-in online, process failed without any explanation. Swiss website didn't help me too, even though I tried to check-in several times. My hopes to pick a window seat were destroyed and I ended up with aisle seat. Second, economy seats on this A343 are generic Recaro seats (which becomes more and more widespread these days, especially on new B787s) and I have to say that they are very bad - just 17" wide between armrests (it's ridiculous, because A340/330 can accomodade up to 18.3" seatwidth in 2-4-2 layout and I know it exactly !!! ), hard and uncomfortable. Third, WK is very greedy with seat pitch - it is ridiculously small, like in LCC narrowbodies. I'm 5'8" and slim person and I felt very cramped in every dimension in this seat. Aisle seat are especially bad because you can't lean to the aisle - the aisles are narrow and you'll be bumped constantly by the passing FA's and passengers. Window seat have 4" gap between the seat and the wall and are considerably better in terms of personal space. Fourth, the meal service is very bad and poor. I can only appreciate vegetables from the hot meal and ice-cream. Everything else is tasteless and disgusting. At the end of the flight I was hungry. From the positive side, FA's were polite and the flight was on-time. Everything else was bad. WK spoiled my vacations in Capetown and refused to give me any compensation. My recommendation: stay away from this airline as far as possible. I deeply regret not choosing Turkish Airlines for this trip - they are 4 heads ahead of WK in every aspect and would be significantly cheaper. Seats 2D-2E. 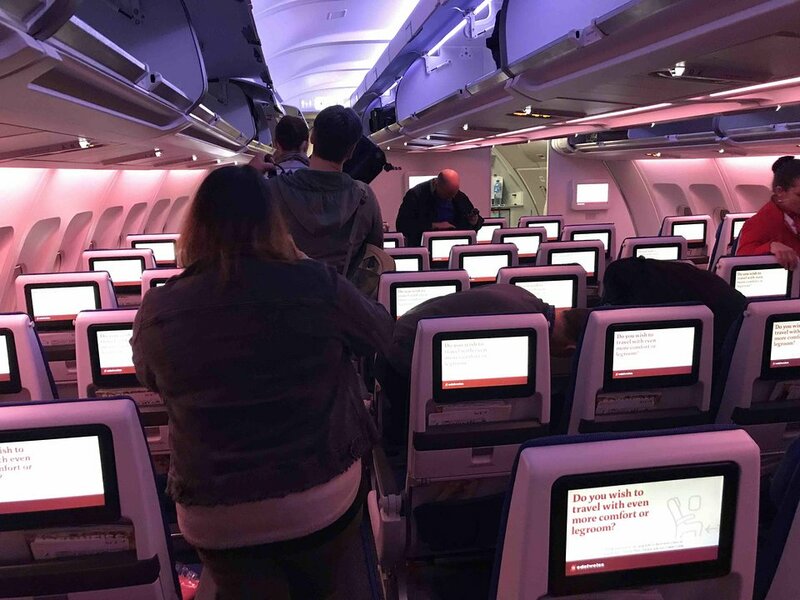 In fact we had the whole middle row 2 for ourselves which meant that my wife could sleep as if in bed for most of the journey from Zurich to Las Vegas. Great legroom, very good food. Quiet ride as we were at the very front of the cabin. Absoluterly worth the extra money. Bad seat. At row 39 and behind the b seats are at a slight angle. Considerable less leg room for right leg than other seats. Seat 42J is on the first row where the center seats are three instead of four making the aisle generously wide here which I liked. Seats new, food great, good flight. This airplane is newly refurbished, it looks like new. They have a great variety of movies, big screen, easy to use. Appreciated the good service and the excellent food! Edelweiss Air flies 1 versions of Airbus A340-300.